I picked this book up on a whim while I was at the library, and I’m so glad I did! I’m not going to lie, the reason I first picked this book up was because of the cover. It’s beautiful, and simple, and classic looking. I love the yellow dress on the front, as well. Then I read the synopsis, as one does, and was immediately pulled in. Oh gosh it was so fun to read. After picking this up from the library I went to Goodreads to see some general reviews, just to get a feel as to what I was about to read, and was a little nervous. And people were so angsty about this. I don’t understand what the issue is. It is supposed to be sarcastic sounding. I feel like sometimes people look into things like this too much. It was that she never thought she would, but she ended up posing. She didn’t regret it at all, and I think that that showed a strong character. Near the beginning when I found out she was betrothed to this guy, I was really against the other love interest, Will. I was being somewhat judgey of Victoria because she knew she shouldn’t be drawing this other guy, but I couldn’t dislike him. Wow. William Fletcher was my favorite character in this story because he was so happy and so encouraging to Victoria. If it weren’t for him she probably would have given up on her dreams of being an artist. Her family didn’t believe in her, and made it impossible for her to create, so she turned to Will and I’m so glad she did. Their relationship was so cute. There were so many parts of this story that my heart just felt so happy and full. All of you know the feeling I’m talking about. The one where you almost have to make a high pitched noise because your heart is so happy. Cause yeah, same. I think the reason I liked their relationship so much was because it reminded me of my relationship. My boyfriend is supportive of me just as Will was to Victoria, and it was just so cute. This book took a turn that I didn’t think it would take, but I really enjoyed it. I was not expecting to get a heavy suffragist theme, but I really enjoyed it. The women were fighting for equal rights, and I really respected that. I couldn’t have been put in Victoria’s place where she had to be prim and proper her whole life just so then she could be respectable in her class. I would be a suffragist because, I too, believe in equal opportunities for men and women. I really love historical fiction, and this book just reminded me of that. 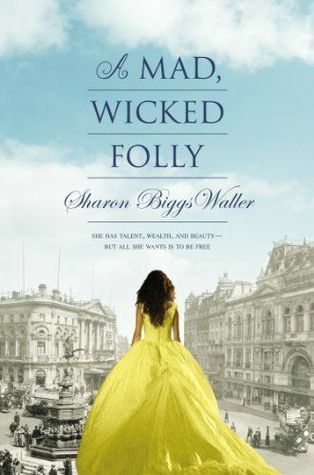 I really enjoyed reading this, and loved that Sharon Biggs Waller had some of the history in the back of the book. I love when authors actually research their writing to make sure it’s historically accurate. Overall, I really liked this book. It was a relatively fast read, and it put me in a historical fiction mood again! Pick up this book if you want a cute romance and a strong female lead. Great review! I’ll have to add this to my TBR!